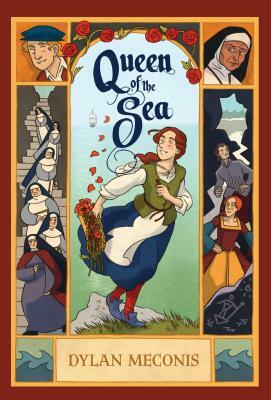 When her sister seizes the throne, Queen Eleanor of Albion is banished to a tiny island off the coast of her kingdom, where the nuns of the convent spend their days peacefully praying, sewing, and gardening. But the island is also home to Margaret, a mysterious young orphan girl whose life is upturned when the cold, regal stranger arrives. As Margaret grows closer to Eleanor, she grapples with the revelation of the island’s sinister true purpose as well as the truth of her own past. When Eleanor’s life is threatened, Margaret is faced with a perilous choice between helping Eleanor and protecting herself. In a hybrid novel of fictionalized history, Dylan Meconis paints Margaret’s world in soft greens, grays, and reds, transporting readers to a quiet, windswept island at the heart of a treasonous royal plot. Dylan Meconis is a cartoonist, writer, and illustrator who created the graphic novels Family Man, Bite Me!, and Outfoxed, which was nominated for a Will Eisner Comic Industry Award. She lives with her wife in Portland, Oregon. The art, reminiscent of Raina Telgemeier’s style, creates levity during perilous situations. The book is dense with dialogue, often feeling more like a work of prose than a graphic novel. As a result, this complex work will be more accessible to those familiar with graphic novels...Certain to charm sophisticated graphic novel devotees. Meconis offers an atmospheric alternate history inspired by the childhood and succession of Queen Elizabeth I in this quietly ambitious graphic novel...Art in soft, earthy colors brings this singular story to life in styles ranging from simple line drawings to elaborately styled text illuminations. The island world is richly developed, both in its physical particulars and its close-knit community (fascinating digressions into topics such as convent time, hand gestures used at table, and chess and embroidery flesh out daily life), and Margaret proves herself an endearing heroine with a strong voice full of humor and wonder. Her perspective transforms a storm-wracked rock into a vibrant world of hidden treasures.